Tom Cruise and Jolin had oolong tea on May 24th in the afternoon at Sin Hong Choon in Taipei! The actor was in Taiwan as part of his promotional activities in Asia for The Mummy. Last Wednesday Tom Cruise immediately praised Jolin and congratulated her on her success. Jolin said that 17 years ago, she was a little girl, and nervous, she didn’t dare looking at him in the eye, but now she is not nervous at all. They talked about their respective lives, respective careers and their fans. When asked about what they do in their spare time, Tom Cruise answered that making a movie, traveling around the world to promote it and meeting people was like a holiday for him, and the best kind, and that he loved to learn new things as well. It took Jolin 7 days to make the two cakes you will see in the pictures. He was reluctant to “destroy” the cake, but Jolin insisted. Tom Cruise offered Jolin peonies and a diary inscribed with her name, and said “17 years ago you gave me flowers so now it’s my turn to return the favor”. The actor wrote a secret in the diary: Jolin said she would write her own secrets in it, and that the diary would become a secret between the two. 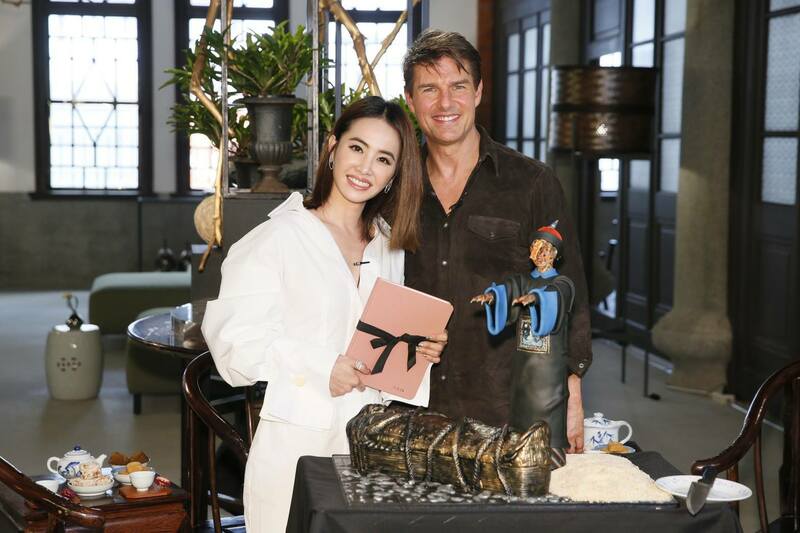 Universal Pictures Taiwan has uploaded videos of Jolin and Tom Cruise’s meeting on its official YouTube channel yesterday (English audio and Chinese subtitles)! Previous postPrivate fan meeting in Shanghai, new upbeat single coming in June!